Where do stars end and brown dwarfs begin? The relation between size and temperature at the point where stars end and brown dwarfs begin (based on a figure from the publication) Image credit: P. Marenfeld & NOAO/AURA/NSF. Stars come in a tremendous size range, from many tens of times bigger than the Sun to a tiny fraction of its size. But the answer to just how small an astronomical body can be, and still be a star, has never been known. What is known is that objects below this limit are unable to ignite and sustain hydrogen fusion in their cores: these objects are referred to as brown dwarfs. Using observations from the SOAR 4.1-m telescope and the SMARTS 0.9-m telescope at CTIO in Chile, the RECONS group from Georgia State University has found clear observational evidence for the theoretically predicted break between very low mass stars and brown dwarfs. More in NOAO Press Release 13-11. 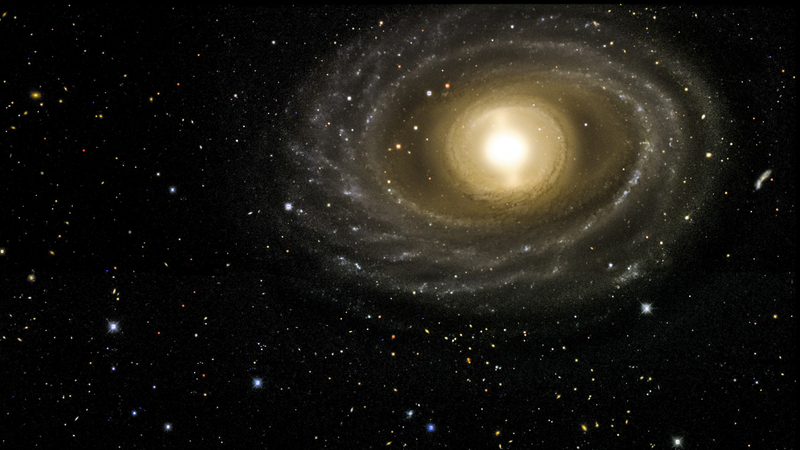 This image of the NGC 1398 galaxy was taken with the Dark Energy Camera. This galaxy lives in the Fornax cluster, roughly 65 million light years from Earth. It is 135,000 light years in diameter, just slightly larger than our own Milky Way galaxy, and contains more than a hundred million stars. Credit: Dark Energy Survey. Tonight, as the sun sinks below the horizon, the world’s most powerful digital camera will once again turn its gleaming eye skyward. Tonight, and for hundreds of nights over the next five years, a team of physicists and astronomers from around the globe, working from an observatory in Chile, will use this remarkable machine to try to answer some of the most fundamental questions about our universe. On Aug. 31, the Dark Energy Survey (DES) officially began. Scientists on the survey team will systematically map one-eighth of the sky (5000 square degrees) in unprecedented detail. The start of the survey is the culmination of ten years of planning, building, and testing by scientists from 25 institutions in six countries. Cropped view of Spiral Galaxy M51, demonstrating the excellent sharpness of the One Degree Imager (ODI) on the WIYN 3.5-m telescope on Kitt Peak. Image credit: K. Rhode, M. Young and WIYN/NOAO/AURA/NSF. The Whirlpool Galaxy (Messier 51) has been a popular night sky target for astronomers for centuries. Charles Messier first identified it in 1773 and listed it as number 51 in his catalog. To him, it looked like a faint, fuzzy object that might be a comet. William Parsons, the 3rd Earl of Rosse, used his 72-inch telescope “Leviathan” to observe the Whirlpool in 1845. Since then, Messier 51 has likely been targeted by virtually every telescope in the northern hemisphere. It is found in the constellation Canes Venatici (the Hunting Dogs) and is a classic example of a spiral galaxy. Now, a new camera on the WIYN 3.5-meter telescope at Kitt Peak National Observatory has imaged the Whirlpool Galaxy anew. The wide field of the One Degree Imager (ODI) camera makes it possible to capture the entire galaxy and its companion in one pointing, something that even the Hubble Space Telescope cannot do. NGC 6334 - A Mini Starburst Region? In this false-color image of NGC 6334, red represents the Herschel 70 micron IR image, green represents the IRAC 8 micron image and blue represents the NEWFIRM 1 micron J band. The region is about 70 light years wide. Image credit: S. Willis (CfA+ISU); ESA/Herschel; NASA/JPL-Caltech/ Spitzer; CTIO/NOAO/AURA/NSF. Stars are known to form in dense clouds of gas and dust, but why do some regions show prodigious rates of star formation, while others barely produce any young stars at all? Many of the richest sites are found in distant galaxies: the name “starburst” is applied to them. Now, a team has identified a region in our own galaxy that may deserve this title, and help explain what leads to the furious production of new stars in a starburst region. In a new study using the NOAO Kitt Peak National Observatory Mayall 4-meter telescope, observations of a large sample of stars with candidate planets identified by the NASA Kepler Mission have revealed that many of the stars, and hence their planets, are actually somewhat larger than originally thought. In addition, the researchers confirm that planets larger than Neptune are more likely to be found orbiting stars that contain more heavy elements (such as iron) than the Sun. Small planets, however, have been discovered around stars both rich and poor in metals. Using the new wide-field camera at the WIYN 3.5 meter telescope, astronomers have found that the peculiar asteroid P/2010 A2’s tail is much longer than previously supposed. The tail is about a million km long, roughly three times the distance from the earth to the moon. Images taken with the new One Degree Imager (ODI), a wide field optical camera at the WIYN telescope on Kitt Peak (see figure 1) reveal a tail that stretches over a quarter of a degree from the body of asteroid P/2010 A2. The ODI camera can currently image an area of the sky about the size of the full moon: a future upgrade will increase the size of the field to about four times as large. Left: The position of the Kepler field in the sky, with the Kepler stars identified by number. The sky was imaged using a diffraction grating to show the spectra of brighter stars. Image credit J. Glaspey; telescopes imaged separately and combined, credit P. Marenfeld. For centuries, humans have pondered what life on other planets beyond our solar system might be like. With the launch of the Kepler Spacecraft in 2009 we now have evidence for the widespread existence of such planets. Kepler’s discovery of hundreds of planet candidates around other stars has inspired a new book that combines both science and science fiction: A Kepler’s Dozen: Thirteen Stories about Distant Worlds that Really Exist . This anthology is co-edited by David Lee Summers (author of The Pirates of Sufiro and editor of Space Pirates ) and Dr. Steve Howell (Kepler Project Scientist). Read more in NOAO Press Release 13-05. Astronomers at the Southern Observatory for Astrophysical Research (SOAR) and the Cerro Tololo Inter-American Observatory (CTIO) have demonstrated the significant difference that sharp stellar images can make in our understanding of the properties of stars. They have observed the globular cluster NGC 6496 using a new instrument dubbed SAM, for SOAR Adaptive Module, which creates an artificial laser guide star. SAM, built by CTIO/NOAO-S, is mounted on the SOAR 4.1 meter telescope. This image of Cep OB 3b was created by combining the light from four separate observations taken through different filters on the 0.9 meter telescope at Kitt Peak. The brightest yellow star near the center of the image is a foreground star, lying between us and the young cluster. The other bright stars are the massive young stars of the cluster that are heating the gas and dust in the cloud and blowing out cavities. Image processing was done by Dr. Travis Rector. Watching starbirth isn’t easy: tens of millions of years are needed to form a star like our Sun. Much like archeologists who reconstruct ancient cities from shards of debris strewn over time, astronomers must reconstruct the birth process of stars indirectly, by observing stars in different stages of the process and inferring the changes that take place. Studies show that half of the common stars, including our Sun, formed in massive clusters, rich with young stars, from which they eventually escape. As part of his PhD thesis work, Thomas Allen, University of Toledo, has been observing such a region where stars are forming. An international team led by Nicholas Moskovitz (MIT), observed the asteroid with a number of telescopes, including the 2.1m telescope at Kitt Peak National Observatory: the video (linked in the release, animated .gif files) shows the asteroid as it was leaving the vicinity of the earth. On February 15, asteroid 2012 DA14 passed extraordinarily close to the earth. Unlike the unexpected asteroid collision over Russia that day, this encounter never presented any danger but astronomers were eager to observe the event. An international team led by Nicholas Moskovitz (MIT) observed the asteroid with a number of telescopes, including the 2.1m telescope at Kitt Peak National Observatory: the accompanying video shows the asteroid as it was leaving the vicinity of the earth. As Dr. Moskovitz said, “Flybys like this, particularly for objects smaller than 2012 DA14, are not uncommon. This one was special because we knew about it well in advance so that observations could be planned to look at how asteroids are effected by the Earth’s gravity when they come so close.” In this movie, the asteroid is seen moving across a field about one third the size of the full moon in about 45 minutes. The field is located in the constellation of the Little Dipper: north is to the left and east is down. This image of a planetary nebula, which may suggest a rose to some, was obtained with the wide-field view of the National Optical Astronomy Observatory (NOAO) Mosaic 1 camera on the Mayall 4-meter telescope at Kitt Peak National Observatory. Sh2-174 is an unusual ancient planetary nebula. A planetary nebula is created when a low-mass star blows off its outer layers at the end of its life. The core of the star remains and is called a white dwarf. Usually the white dwarf can be found very near the center of the planetary nebula. But in the case of Sh2-174 it is off to the right. (It is the very blue star near the center of the blue gas). This asymmetry is due to the planetary nebula’s interaction with the interstellar medium that surrounds it. NOAO is the national center for ground-based nighttime astronomy in the United States and is operated by the Association of Universities for Research in Astronomy (AURA). under cooperative agreement with the National Science Foundation. If you would like information about solar astronomy, visit the National Solar Observatory. If you would like information about radio astronomy, visit the National Radio Astronomy Observatory.